RAPID CITY, SD - The All-American Sheep Day at the Black Hills Stock Show, set for Thursday, January 31, 2019, will feature the North American Sheep Dog Trials, the National Sheep Shearing Competition, Mutton Bustin’ and a new event, Sheep Teepeeing along with educational booths about the sheep industry. Held at the Kjerstad Event Center on the Central States Fairgrounds, the North American Sheep Dog Trials tests the skills of working dogs with the preliminary competition starting at 11 a.m. This event requires a well-trained stock dog and a handler to complete a set course, while herding three head of sheep into a pen. Handlers are only allowed to use vocal commands and dogs are not permitted to make contact with the sheep. The fastest completion times will advance to the finals at 7:30 p.m. Along with the sheep dog trials is the National Sheep Shearing Competition, a timed event that tests the skills of sheep shearers and wool handlers. The phrase coined by the organizers is “Haircuts in 60 seconds or less” showcasing the speed of the event. Judges also evaluate the shearers on their ability to cleanly accomplish the task. The sheep shearing will take place in the James Kjerstad Warm-up arena starting at 10 a.m.
“South Dakota has a thriving sheep industry that many people aren’t familiar with. The All-American Sheep Day is an opportunity for us to educate the general public about the impact of our great sheep producers.” Ron Jeffries, Black Hills Stock Show general manager. Sheep Teepeeing is a new event added to the All-American Sheep Day. Two-person teams will wrestle a sheep, secure the animal and place a handmade teepee over it. Time is declared when teams cross the finish line. “The sheep teepeeing is something anyone can participate in plus it should be entertaining to watch” said John Kaiser, Black Hills Stock Show® Operations Manager. 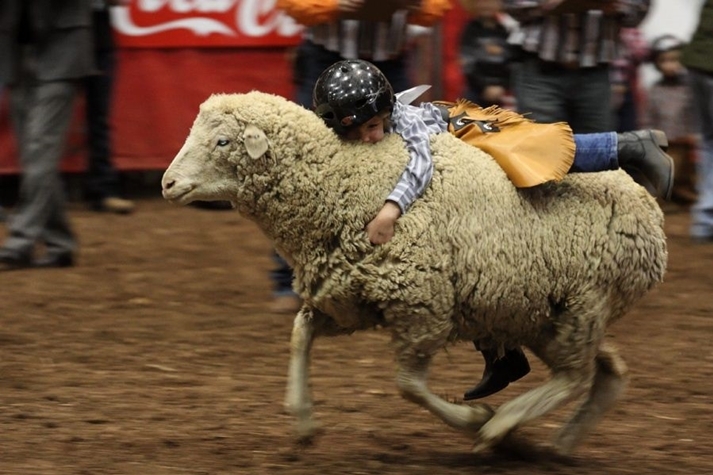 Along with all the sheep action is one of the most notable events, the Mutton Bustin’. Young cowboys and cowgirls ages 3-6 years will take center stage at 7 p.m. Kids will aboard the mutton mount for a six second ride as judges score the individuals. All contestants will receive awards with the top Mutton Buster receiving a trophy. Entries are limited to the first 20 participants.